There is nothing quite as satisfying as a hot frothy drink on a cold winter’s day. It’s the perfect pick-me-up when you’re out doing some holiday gift shopping! Coffee companies make the most of this time of year by not only releasing special holiday inspired drinks — they also roll out fancy cup designs and drink names that are bound to make you smile. No doubt these drinks are delicious … but they’re also packed full of sugar and calories. It’s okay though! This is the season to indulge in your favorite treats and make the most of this festive season. Just plan to log a few extra running miles to make up the difference! 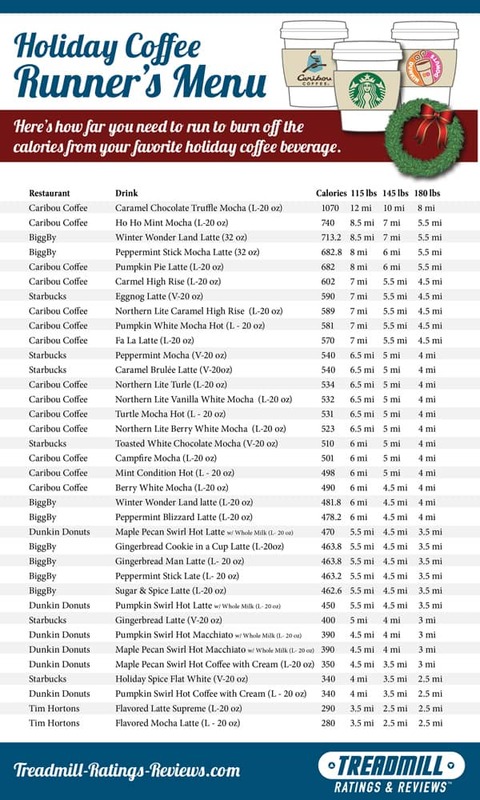 We decided to help you runners out by finding out the “price” of some of the most popular holiday coffee drinks from top coffee shops across the country. Now, when you order your next Peppermint Stick Mocha Latte (umm…I need a coffee break NOW) you can immediately know how many miles of running you need to put in to burn off those calories!